Emily Dickinson and I did not hit it off on the first date. That is to say that on introduction to her work, I saw her--or rather was taught to see her--as a lady like poet writing of hearts and flowers, tendrils and vines, the stuff of which had absolutely nothing to do with my life. In junior high when I came across Dickinson's work, I was already a hell on wheels hard drinking adolescent, a product of my 1970s working class environment that put me on a collision course headed toward disaster. It was my love of language that got me through. I've often heard it said that poetry serves no purpose. Perhaps that is true if one takes a completely materialistic and emotionally bankrupt view of life. But the fact is that two lines of poetry saved my life: Shakespeare's "Tomorrow, and tomorrow and tomorrow/ creeps through this petty pace from day to day." I didn't know it at the time, but that I could recite this part of Hamlet at will, even if I was on my way to being blasted or hung over from the night before, embedded in my mind that I would have a tomorrow. A tomorrow was not a petty thing to have: a few of my friends didn't make it. A few more years passed and I went to visit the Dickinson homestead in Amherst Massachusetts. I was there with a group of friends, some of whom lived in the area and were just visiting her home for the first time. It was ironic really-- there we were a room full of Lesbian poets listening to the tour guide's official wrap about the cloistered and asexual Emily Dickinson, trapped in her father's house. There was something sinister about the house, foreboding. But behind the house, in the flower garden, was a beautiful wash of colors. And as I sat in the garden, on a white wrought iron bench, I peered through a shady grove to the neighboring house. I remember it being painted in the glowing hues of peach, at once golden and pink. There was something mysterious about this house, set back as it was from the road, directly approachable from the Dickinson homestead. If I were Emily I could not have resisted its magic lure. I found out later that this house is where Susan Huntington Dickinson lived. 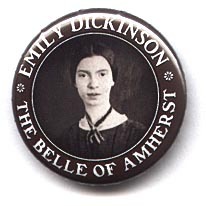 She was Emily's sister-in-law, married to Emily's brother, Austin, and she was the love of Emily Dickinson's life. She was Muse to Emily, her intended reader, thoughtful critic and, by more than a few accounts, she was Emily's lover. In correspondence to Susan, Emily wrote that Susan was "imagination" itself. The two women were close friends for 40 years, and they lived next door to each other for 30 of those years. In "Open Me Carefully: Emily Dickinson's Intimate Letters to Susan Huntington Dickinson" (from Paris Press), the editors, Ellen Louise Hart and Martha Nell Smith, point out that over the course of their lifelong friendship and love affair, Emily sent countless numbers of letters, poems and a form of writing that Emily came to call the letter poem. And on many of these letters, placed for Susan to see when she unfolded them, Emily had written her careful instructions: "Open me carefully." Emily Dickinson lived at the end of the Victorian-era in New England from 1830 to 1886. After her death, any mention of Susan was carefully removed from her poetry and this essential body of correspondence was neglected. Still, even with this erasure of Susan's name, which Emily had written at the top of so many of her poems, it is obvious that they are essentially Lesbian love poems. Consider, for example, the piece that begins with the line "Her breast is fit for pearls..."
"Susan, / Her breast is fit for pearls, / But I was not a "Diver"-- / Her brow is fit for thrones / But I have not a crest, / Her heart is fit for home-- / I--a Sparrow--build there / Sweet of twigs and twine / My perennial nest. / ---Emily"
In Victorian New England, Emily Dickinson certainly could not mention her most intimate body parts. But she did a pretty good job of using the birds and bees as metaphor: "These days of heaven bring you nearer and nearer, and every bird that sings, and every bud that blooms, does but remind me more of that garden unseen, awaiting the hand that tills it. Dear Susie, when you come, how many boundless blossoms among the silent beds!" To separate Emily Dickinson from her Lesbian passions is a cruel and unnecessary act. Not only does it do a disservice to Emily's poetic genius, but it also deprives her readers of a deeper comprehension of Emily and therefore of a deeper understanding of themselves. That's what literature, at its best, does. It leads us home. It really doesn't matter if Emily Dickinson ever made love with a woman. (Although my guess is that she did and most likely did so rather skillfully.) What matters is that she experienced deep rending passion, that must at times, under the circumstances, have been painful. A Lesbian reading of Emily Dickinson places her firmly in the center of her own page. When I think back on my visit to her house, I can see her clearly now, sitting down at her desk after her daily chores were done, as she smoothes the white folds of her skirt and picks up her quilled pen. As she writes, her cheeks are ablaze with longing and desire, that essential Lesbian desire. This piece was previously published on Technodyke.com and aired on This Way Out, the Los Angeles-based lesbian and gay radio syndicate that airs across the U.S. and in 22 countries abroad.